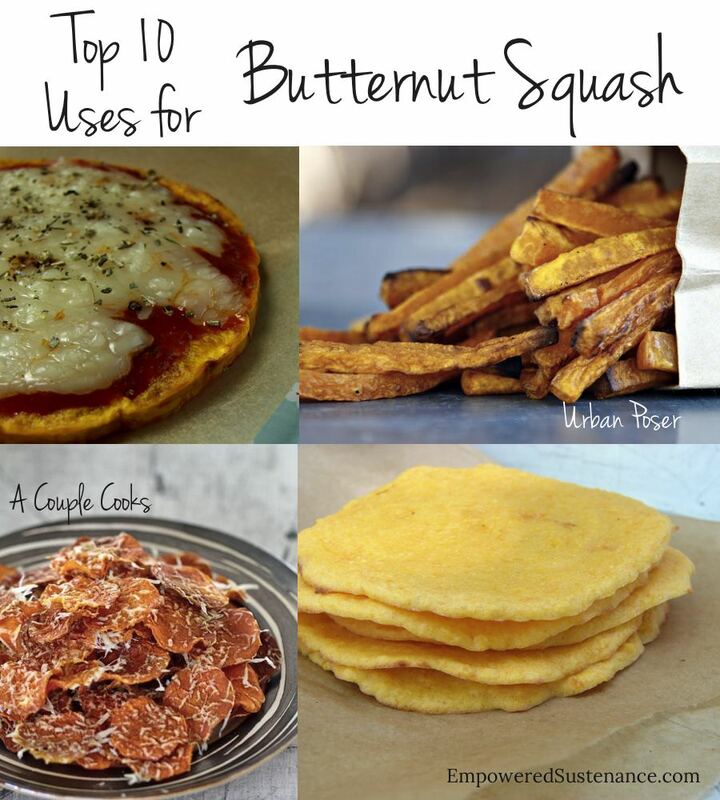 Butternut squash just may claim the title of “Lauren’s favorite ingredient.” I think the love affair really began when I first made my butternut pizza crusts (#1 on this list for a good reason). Butternut squash boasts a full flavor and wide versatility, especially for grain-free meals. Many of these recipes call for cooked and mashed/puréed butternut squash. A nearly hands-free preparation is to cook the butternut squash in a crockpot. Ready to change your life? Discover the gloriously simple Butternut Squash Pizza Crust. Skip the rice and turn butternut squash into a creamy risotto. I have a proud mama moment each time I share my one of my most prized recipes: Butternut Flatbread. This easy, grain-free flatbread turns into hamburger buns, sandwich bread, mini pizza crusts and more! The Urban Poser has perfected the technique to get crispy and paleo butternut squash fries. Squelch your craving for potatoes fried in toxic vegetable oil with this more colorful baked version! No noodles? No problem! Thinly sliced butternut squash replaces the wheat noodles in this Butternut Squash Lasagna from Health Bent. If you want to get a little frivolous in the kitchen, make a Savory Butternut Squash Soufflé. And don’t forget to don your frilly apron while you are at it. “Cheesy” Chicken Casserole… without the cheese! Gloriously creamy and savory, you won’t believe it until you try it. I created this recipe to satisfy my cheese craving without cheese and it fits the bill. You are only two ingredients away from a plate of butternut squash pancakes! The recipe calls for pumpkin puree, but simply substitute mashed butternut squash. You will have this recipe memorized after your first time. Mashed butternut squash makes a simple breakfast porridge topped with fruit and coconut milk. I like to mix in a big spoonful of coconut butter (that’s an amazon link), which lends a thicker and creamier texture. Satisfy a potato chip craving with crispy and salty Butternut Squash Chips. It’s perfect simplicity. Do you frequently reach for butternut squash as frequently as I do? Microsoft Office Support gives tech support service for office365, ms word, excel, outlook, excel and much more. For more queries, please discuss with us.